Amy, an enterprising former student of mine, was telling me last Summer about her aim to set up workshops in Oxford and invite teachers in. Having agreed to do an initial workshop, I asked what she’d like me to teach and this was her reply. “How about backs, indeed!” I thought to myself. Backs are a very common complaint. In fact, probably most of us have suffered with a sore or painful back at some stage in our lives. And it is a well-known fact the number of working hours that are lost every year owing to back problems. Nevertheless, I was somewhat surprised by her request as I had not expected such a practical topic. “Why not?” I replied, “Backs will be fine!” and a date was arranged for December. Over the next few months I had the opportunity to really focus on how I worked on clients presenting with back problems and what seemed to be helpful. Previous to this, even though I have been practising Shiatsu for quite a long time, I had never really felt I had a speciality of any kind. There have only been a few occasions when I have, for an instant, considered specializing in any field. The first of these was when I was pregnant and was able to appreciate at first hand how helpful Shiatsu could be in facilitating a healthy and empowered pregnancy and birth. And, subsequently, there was a moment when working with children really appealed, something to do with the simplicity and directness of approach. However, neither of these desires ever really took hold, as the desire to continue to work with a very varied base of clients has always been stronger. Whether male or female, young or old (or middle-aged! ), in good health or seriously (sometimes terminally) ill, I have relished the variety and wealth of experience they brought to my shiatsu practice. And, if anything, my main focus over the years has been to improve my quality of touch and communication so that I can be really present for my clients. Nonetheless, with the spotlight firmly on ‘backs’, I was curious to discover what information would arise. My first move was to go through my client records, both past and present, to find out how many presented with symptoms of back pain. I was not surprised to learn that about half of my current clients were coming for Shiatsu because of pain or discomfort in the back. I included neck and upper back pain as part of the overall scope of back pain, even though it is often overlooked that the neck and upper back are very much related to the lower back. What did surprise me, however, was the number of clients who presented with other symptoms, for example, depression, but who had, at some stage in the past, experienced back pain or trauma of some kind, and for whom work on the back was needed before they could truly move forward. So it became increasingly obvious how, just as the spine is so central to the skeleton, the back is central to how we function as human beings. This led me to the next stage of my investigation: to observe how I work with backs and what seems to help. I realised that I tend to start by considering the structure of the back and specifically the spine, both from a Western anatomical and an Oriental viewpoint. I don’t want to spend too long with anatomical description here as most of you will be very familiar with the structure of the spine but here are the bare bones of it. The human spine (or backbone) is made up of 33 bones called vertebrae. The vertebrae are stacked on top of each other to form a column, the two lower sections known as the sacrum and coccyx consist of 5 fused vertebrae and 4 fused vertebrae respectively. 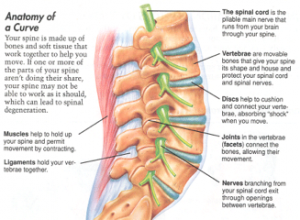 Between each vertebra is a cushion known as a disc. The vertebrae are held together by ligaments, and muscles are attached to the vertebrae by bands of tissue called tendons. Openings in each vertebra line up to form a long hollow canal. The spinal cord runs through this canal from the base of the brain. Nerves from the spinal cord branch out and leave the spine through the spaces between the vertebrae. The lower part of the back holds most of the body’s weight. Even a minor problem with the bones, muscles, ligaments, or tendons in this area can cause pain when a person stands, bends, or moves around. Less often, a problem with a disc can pinch or irritate a nerve from the spinal cord, causing pain that runs down the leg, below the knee, called sciatica. Working on the physical level by contacting the bony structures, always feels a good place to start. By making contact with each of the vertebrae, from the sacrum and coccyx to the neck, I find I can ‘tune in’ to the person. It is also an effective way of bringing the client’s attention to a part of him that is likely to be blocked or protected in some way. This is certainly my experience of backs. The bones support our structure in relationship to the downward pull of gravity. Our uprightness distinguishes us from other animal species and has caused our bones and musculature to adapt in order for us to stand and move most effortlessly. Yet being upright does not mean that the spine is straight and vertical. In fact, usually, only the upper two cervical vertebrae and the upper lumbar are in line with the vertical plane as viewed from the side. There are four natural curvatures of the spine: the cervical and lumbar sections form a convex curve forwards and the thoracic and sacral sections form a convex curve backwards. In the foetus, the backbone has a single curvature in the thoracic and sacral regions. The cervical curvature develops in infancy as the baby learns to hold its head up. The lumbar curvature forms as the baby learns to sit, crawl, stand and walk. The amount of curvature varies greatly from person to person and what I am looking out for when working the bones are any areas where a vertebra is out of line, whether sinking in or more prominent or slightly to one side. The overall feel of the spine indicates the health of the bones, which in health are quite springy. 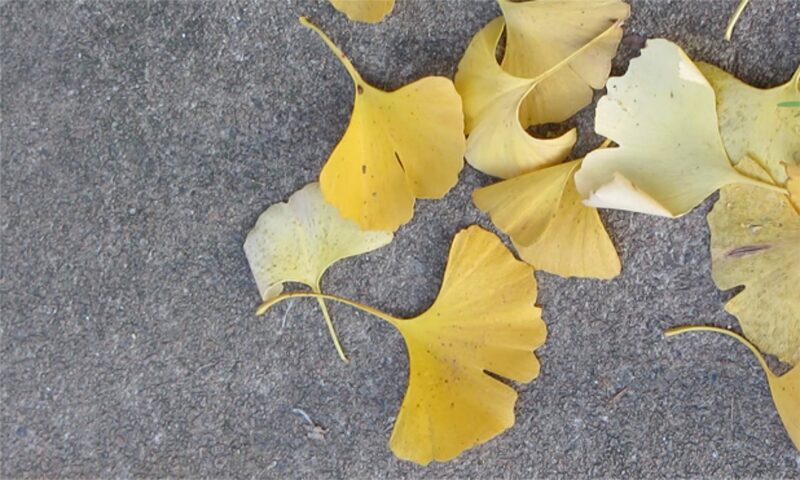 This springiness is also an expression of the state of the inter-vertebral discs. These discs are made of connective tissue with a soft, jelly-like central component and a tougher surrounding tissue. They allow a for a wide range of different movements and, as the spinal column’s natural shock absorbers, protect the vertebrae from excessive pressure. When they become thin the spine tends to lose its natural flexibility and the bones can feel rigid or as if ‘locked’ together. Another contributing factor to loss of flexibility in the spine is the diminution of synovial fluid in the joints. Synovial fluid is the fluid of the skeletal system and is produced in the synovial membranes of the joints. It functions to keep the joint and surfaces lubricated, separated and nourished. In conditions such as arthritis, the fluid dries up. This can be caused by an inflammation of the synovial membranes, which then stop producing the fluid. The membranes are, in turn, dependent on blood circulation for nourishment and elimination of waste. In such cases where the spine has this feel of ‘dryness’ or ‘compression’ it is helpful to create some space in the joints. Movement, whether active or passive, is vital here to bring about change. This change often happens first in the person’s awareness of the area and then in the gradual unlocking of the vertebrae. Sometimes, I work the joints manually and at others I get the person to perform a simple exercise. With the latter, I find that applying pressure and support to the area that does not move in synchronisation with the rest of the spine helps the body to start to self-organise and, in time, regain its flexibility and alignment. It is impossible to talk about movement without introducing the muscles and ligaments and looking at their role in relationship with the bones. 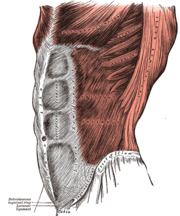 There are many muscles involved in the support and movement of the back. Back pain, in my experience, is often the result of a muscle tightening to too great an extent or else over-stretching and, just like a length of elastic when it is overstretched, losing its natural elasticity. Muscles like to work in pairs or as part of a team in performing a wide range of different movements. Most of us are aware of how, in the arm, as the biceps contracts to flex the elbow, the triceps elongates. And the opposite occurs, that is, the triceps contracts and the biceps elongates as the elbow is extended. The same happens when we move our backs. With each movement there will be a muscle contracting and a corresponding muscle or group of muscles lengthening. Hence, when there is a muscle that feels tight and overly contracted, there will be another muscle, which is the pair or part of the team of muscles involved in that movement, that will feel ‘weak’, loose or seem to have lost its elasticity. In conventional terms, when we speak of a particular movement the muscle that produces it is called an agonist and the muscle that produces the opposite movement is called an antagonist. Often it is the agonist or active one that gets all the attention, for example, the work done by bodybuilders to create an impressive “six-pack”(rectus abdominis) on the abdomen. However, as I have already mentioned, muscles work in pairs or as part of a team. The agonist and antagonist swap roles of agonist and antagonist in order to reverse the movement. Also there is usually the downward pull of gravity at play in the movement, too. In the case of the “six-pack”, overwork of the abdominals can put them in a state of contraction so that they lose/forget their ability to relax and return to a state of tonus. As a result the corresponding antagonists, in this case probably the erector spinae, the deep muscles that lie close to the spine, are kept in a state of overextension, can lose their elasticity and often become loose and flaccid. In my recent study with Bill Palmer I have come to appreciate the importance of the role of the antagonist in any movement and how, by encouraging this muscle to maintain or regain its elastic nature, this helps in facilitating the overall synergetic function of the muscles. The willingness of muscles to compensate for the bones is evident here. But they are also often eager to step into the breach when another muscle is partially or fully disabled. This can be as a result of injury but can also happen when a particular muscle or muscle group becomes ‘switched off’ through disuse. This willingness to compensate is often necessary in the short term but becomes a problem when the willing muscle has to continue to fulfil this role on top of all the other movements included in its normal job description. It is hardly surprising that it soon becomes overworked, disenchanted and confused! In this situation I find my aim is to isolate and identify the muscles involved and remind them of their relationship to each other and to the rest of the body. This often involves encouraging the natural elasticity of each muscle, either by taking the contraction a stage further or by allowing the muscle to lengthen to what feels a healthy limit. And so to meridians and their role in back work. In fact, you might be wondering how all this talk about bones and muscles can be of use to a Shiatsu practitioner who likes to work with meridians and Ki! Of course, in Shiatsu we work primarily with meridians. However, the meridians are not merely lines on the body’s surface. In my experience, in contacting a meridian it is possible to go much deeper then just the surface and involves a contact that can penetrate deeper than the skin, through the fascia, muscle, organ and even bone to reach the level where the Ki is needed. For example, when working the leg from ST 36 downwards, although the ST meridian guides me towards the second toe, my attention goes from each point of contact on the skin to the muscle (in this case tibialis anterior) and possibly to the bone (tibia). I might find that the muscle is tight and held or that the bone has a heavy or leaden feel to it. This informs me of the level where the attention/work is required and the ST meridian guides me towards a probable cause and a possible solution. Working the meridians is not about limiting the practitioner to a single dimension but about enabling him to work in a more multi-dimensional way. However, this is only one way of working with Shiatsu. Integrating Oriental theory with Western anatomical knowledge is a means of bringing East and West together as Masunaga did with his Zen Shiatsu theory. We have many resources of theory in Shiatsu for diagnosing and treating the back. Back diagnostic maps, Yu or Shu points, classical and extended meridians, Hirata and Suzuki zones and more. These are all helpful in building a picture of the person. Through Oriental theory we know that the back relates especially to the Water element. 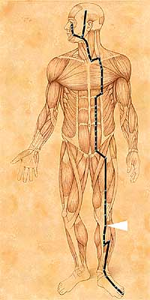 The Bladder meridian runs close to the spine and the Kidneys are said to support the lower back. This aspect of support is important. The Water supports us in a different way from the more tangible support of the Earth. The Water supports us in what we inherit from our parents and this supportive link threads right back to our earliest ancestors. It gives a sense of ‘belonging’ or heritage. Without this we can struggle to find our ‘place’ in life and feelings of fear can arise. Fear is not an easy emotion to admit to. It can also hold us back (literally) from advancing through life as we would like to. It can be disguised or hidden but remain lodged in some way and often the obvious hiding place is ‘behind us’ in our backs or spines where it can be ignored and forgotten about. Quite often I find that locating and contacting a trouble area in a client’s back brings back memories of a traumatic experience of the past. On one occasion when I contacted a painful area in a client’s back, close to his left kidney, he suddenly recalled having had an operation for kidney stones in the left kidney when he was about eight years old. He was in a lot of pain after the operation when it was discovered that a tube had been accidentally left in his back and he had to have another operation to remove it. He had totally forgotten about this and was surprised by the memory. It was apparent that, on some level, healing had failed to take place. Somehow bringing up this memory allowed the tissues to heal and his back improved. He had come for Shiatsu initially with very acute neck pain. In Shiatsu, too, we have the added dimension of the understanding from the Oriental perspective of how the organs fill the internal cavity of the pelvis and ribs in the front of the spine. The organ we are probably most aware of is the Lungs. We can feel the ribcage expand as we breathe in and relax as we breathe out. And see how, by not breathing or by holding the breath, the whole of the chest can become locked and rigid. Also if the Lungs are never filled to their full capacity they can never expand to fill and support the chest. The lack of support at the front can lead to all kinds of problems in the upper back, which then has to work harder at supporting the neck and skull. The same can be true for all of the organs, though in a less obvious way. The lower abdominal organs, for example the bladder, reproductive organs, and large intestine all serve to fill and support the lower back and sacrum. 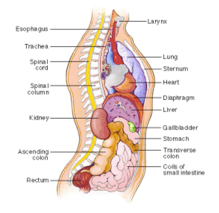 The digestive organs and kidneys support the midback and the heart and lungs the upper back. This is a real strength of the Oriental approach in that it doesn’t just focus on the spine but on all the supporting structures around it as well. It is all part of seeing the body as truly 3-dimensional and every part working as part of an integrated whole. In instances when it seems that the root of the problem lies in an organ the first move is to make contact with that organ. Placing the hands around where the organ lies and focussing the attention between the two hands can be helpful. At other times it can be beneficial to encourage the client to breathe into the organ and so bring his awareness to that part of him. And so, an exploration that was fuelled purely by curiosity at the outset has opened up to me all kinds of possible approaches to working with backs. It has been a personal journey and is by no means comprehensive. It has certainly made me aware of the potential Shiatsu has for easing back problems and made me all the more determined for Shiatsu to get the recognition it deserves. Sonia Moriceau often says that all the techniques and knowledge that we have at our fingertips as Shiatsu practitioners are like tools in a tool bag. We take the tool bag to the job in hand and take out of it whichever tool is appropriate for the task. This exploration sparked by Amy has helped me appreciate how full my tool bag is when the task in hand relates to backs!